Primary school children from across the county came to the University for a special graduation ceremony to celebrate their learning achievements. Around 70 students from the Devon Children’s University received their ‘degree’ certificates from Professor Iain Stewart after completing their out-of-school programmes. Iain, Chancellor of the Devon branch, broke from filming his latest BBC programme to lead the ceremony on campus – the second annual graduation since the university launched in 2012. In total, 270 people attended the event, with many of the families travelling from the Okehampton and Tavistock areas to be a part of the celebration. It began with a pre-graduation party in a marquee on campus, where there were a number of interactive activities laid on by some of the learning partners in the Children’s University, including the Barbican Theatre, the Theatre Royal, and the Plymouth University Raiders basketball team. The children, who ranged in ages from 7-14, were fitted for their gowns and then followed the Plymouth University ceremonial mace in a procession to the Sherwell Building. There, they were addressed by their Chancellor, Professor Stewart, who at one stage demonstrated the techniques for wrestling an alligator. He then presented scrolls and gold badges to the graduating students. Each had undertaken at least 100 hours of out-of-school learning, with some passing the 200 and 300-hour marks to earn Gold Certificates and Gold Diplomas respectively. Plymouth University and Devon County Council have jointly developed the Devon initiative, with the help of accredited ‘public learning destinations’ such as Paignton Zoo and Living Coasts. 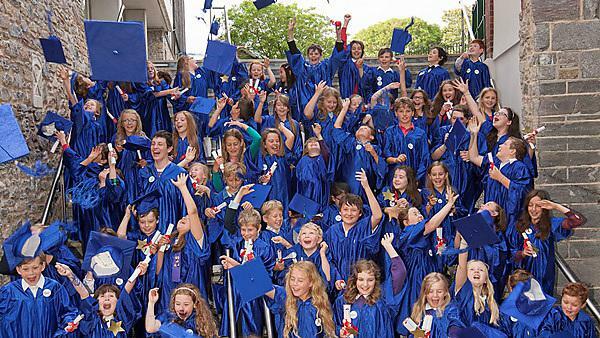 The University also helps to run the Cornwall and Torbay branches of the Children's University.